Takeaway: The convenience of the Internet is not lost on nefarious types who need a quick and safe way to launder money. Crime appears to pay, if the amount of money being laundered is any indication. Reports estimate that criminals launder close to $1 trillion each year. To give that some context, $1 million U.S. dollars weighs about 256 pounds; $1 trillion weighs in at 128,000 tons. The same reports also expects that total to increase dramatically in the coming year. It seems that the bad guys are now harnessing the power of the Internet to quickly and efficiently launder their ill-gotten gains. Before tackling how and why the Internet is making it easier to clean dirty money, let’s look at some terms used to describe the money laundering process. Money laundering is the attempt to obfuscate the source of illegally obtained money, preventing law enforcement agencies from linking suspects to the crime. Here's how it works, step by step. Placement: The first step is to insert the dirty money into a legitimate, or what appears to be a legitimate, business. The trick is to know how much and how often to inject cash without raising suspicion. Integration: When the criminals feel the chances of tracing the money back to the original crime are slim to none, the money is placed back into circulation. That means pay day for the patient criminals. So how do criminals obfuscate the stolen money’s origin? For that, I turned to Jean-Loup Richet, research associate at the ESSEC Business School near Paris, and his report for the United Nations Office on Drugs and Crime called "Laundering Money Online: A Review of Cybercriminals Methods." Richet starts out by explaining how he obtained his data. His methodology employed a bad-guy weakness: They like to talk (brag) about their success with like-minded individuals. 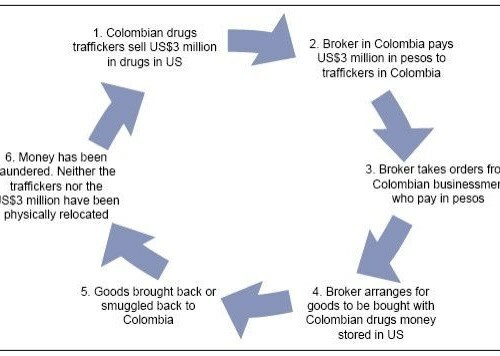 "We used a large variety of keywords, from those linked with payment solutions to those associated with black markets. After a first review, we filtered our data, and discarded irrelevant forum threads. We then analyzed the content of these threads and synthesize our findings into the following categories." The two categories Richet refers to are the scams that do not need the Internet to succeed, and those that do. 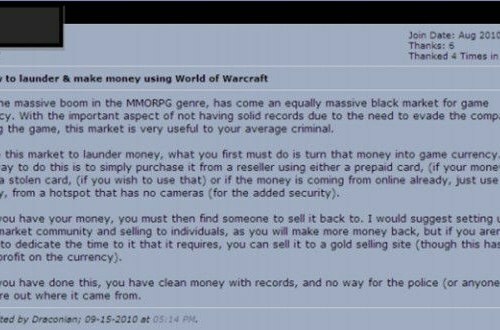 Those that have been around long before the Internet are money-mule scams and black markets. Needless to say, even these swindles have benefited from the World Wide Web. First, money mules. 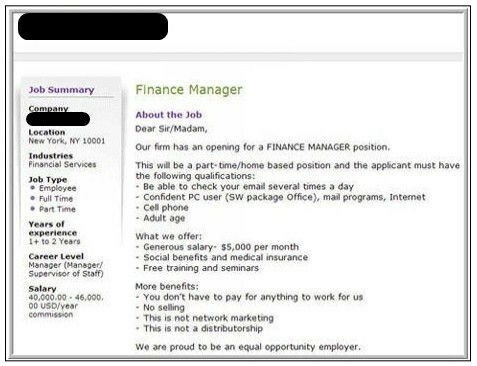 According to security blogger Brian Krebs, most money mules are, "Unwitting and inexperienced Americans tricked and cajoled into laundering money after being hired for bogus work-at-home jobs." Richet provided the following money-mule job advertisement as an example. Black markets, on the other hand, are simply a way for goods or services to be traded illegally. The thing to remember is that what’s being traded is usually not illegal, but the transaction is. For an example, Richet uses one of the more notable black markets - the Black Market Peso Exchange. The following slide explains the process. Next, let's look at how the Internet is becoming a more integral part of the money-laundering process. "Using the virtual currency systems in these games, criminals in one country can send virtual money to associates in another country. Then the virtual money can be transferred into real money, with the criminals leaving no trace of evidence authorities could follow back to them." At first, I thought that infusing those amounts would be obvious. Little did I know the pool of virtual currency swirling around the Internet is equivalent to more than US$1 billion dollars. There's even a cottage industry that converts money into any of the popular virtual currencies and vice versa. Micro-laundering is another option that's gaining popularity in the underworld as a means to launder money. The Internet, powerful computers and traditional payment services now provide online and mobile services. That's music to the ears of those who launder money. Any institution that transfers sums of money is fair game for micro-laundering. Examples include PayPal, virtual credit-card sites and, oddly enough, online job marketplaces. Because comments about PayPal were prevalent on the forums, Richet used it as an example. "One growing scenario: using virtual credit cards as an alternative to prepaid mobile cards; they could be funded with a scammed bank account - with instant transaction - and used as a foundation of a PayPal account that would be laundered through a micro-laundering scheme." The following slide shows a member explaining how to withdraw funds from a PayPal account using a bogus job marketplace account. Money laundering has been going on for untold centuries. What the Internet does is make cleaning dirty money a whole lot easier - and the bad guys a whole lot harder to catch. Slides and quotes were reprinted with permission from Jean-Loup Richet.